The NIH Public Access Policy ensures that the public has access to the published results of NIH funded research. It requires scientists to submit final peer-reviewed journal manuscripts that arise from NIH funds to the digital archive PubMed Central upon acceptance for publication. To help advance science and improve human health, the Policy requires that these papers are accessible to the public on PubMed Central no later than 12 months after publication. With this Notice, NIH informs grantees that in Spring, 2013, at the earliest, NIH will delay processing of non-competing continuation grant awards if publications arising from that award are not in compliance with the NIH public access policy. The award will not be processed until recipients have demonstrated compliance. This change will take effect in tandem with NIH requiring the use of the Research Performance Progress Report (RPPRs) for all Streamlined Non-competing Award Process (SNAP) and Fellowship awards in the Spring of 2013 (see NIH NOT-OD-12-142). 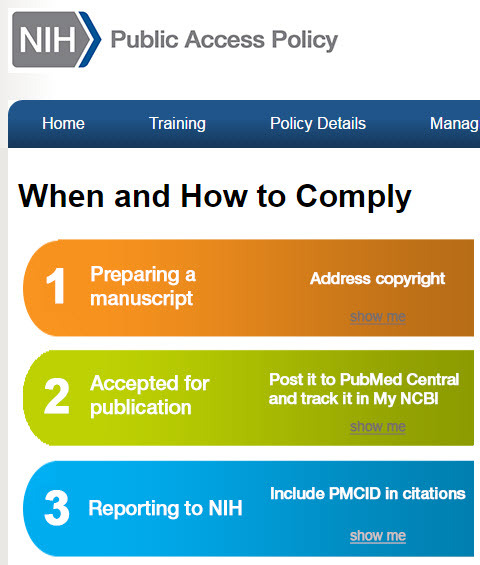 Does the NIH Public Access Policy Apply to You? Directly funded by a contract signed on or after April 7, 2008. Directly funded by the NIH Intramural Program. To determine applicability show me specific instructions for my publication. Contact us if you have questions about the policy or would like help with submitting manuscripts to the NIH Manuscript Submission System.